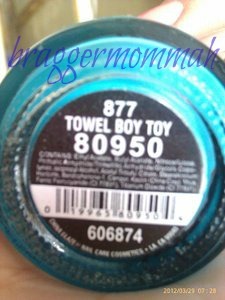 Braggermommah: My China Glaze Nail Lacquer in "Towel Boy Toy"
My China Glaze Nail Lacquer in "Towel Boy Toy"
At last! I got my hands on this pretty little thing! 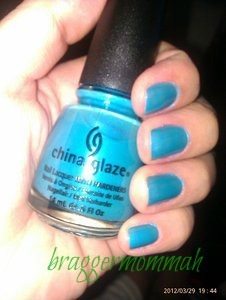 Good thing that there's a China Glaze counter at SM Southmall's department store already! *heaven* I only noticed that there's only 1 bottle per shade. Well, moving on, I can't decide on which shade I should buy. One hand is holding For Audrey, the other hand this one, and my eldest son is holding Flyin' High and Ruby Pumps!. Well, I can't buy all those four so I just decided to just get the color that I was really lemming for. Here it is! It's a pretty blue color, next buy will be something red or pink!